Lloyd Brothers is a wine and olive company. The company property has 30 acres of Shiraz vines (20% of production is kept with the remainder sold) plus mainly Kalamata olives with holding areas for Alpaca’s close to the cellar door facility. Lloyd Brothers seem to be taking a different direction regarding their wines. There is a change from a number of wine variteies from McLaren Vale and the Adelaide Hills to estate based Shiraz based wines (Rose, Shiraz, Reserve Shiraz, Fortified Shiraz and Shiraz Verjuice). 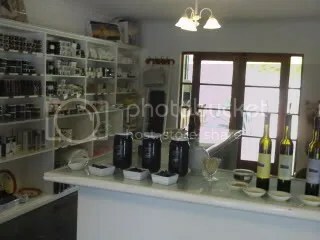 The cellar door also has a large selection of olive oils, olives, gourmet foods, olive oil body care products and alpaca wool products. These products are also combined into well presented gift baskets. My experience with these products have been consistently high quality. Two products of interest are their Lemon Pressed Cold Pressed Extra Virgin Olive Oil and the Lime pressed version. This high quality olive oil was pressed with either lemons or limes to produce the infused flavours. I am looking forward to trying fresh bread dipped into these oils and then dipped into Dhukka. Their web site is www.lloydbrothers.com.au. Check out their location on the Lonely Grape McLaren vale Cellar Door Map. Lets check out the wines. This is an Adelaide Hills wine with a wild yeast ferment. Some of the wine has been barrel fermented. The wine has very pleasant pear and peach aromas with oak ceder giving increased complexity. The palate has a continuation of peaches with a hint of nectarines with a creamy mouthfeel. The oak is not obtrusive though it lingers on the back palate. Drinking this makes me think of a big bowl of fresh pasta, tomato based sauce and chopped grilled chicken breast. the wine had 12 hours skin contact to produce a darker coloured wine than would be considered normal for a Rose. The nose is full of plums, blueberries with a hint of strawberries. The palate is unusually dominated by blackcurrent with highlights of spice. The finish is soft and dry (dryer than most Rose style wine). I consider this a food wine – try it with BBQ’d chicken and a green leaf salad. A very different wine to the 2008 version. The colour is softer (due to only 5 hours skin contact) and the nose is dominated by red berries. The palate is strawberries with a hint of creamyness on the back end. There is some residual sugar and as such is a more main stream Rose. Consumption of this wine should be done cold and with friends (not necessarily with food). The nose was a little challenged with just a slight waft of blackberries. The palate is berries with fruit cake, soft tannins and minimal oak influences. The wine finishes a little quickly for my palate. Bring on the BBQ’d char grilled meats with this one. 2007 was a very different vintage with distinct drought conditions for most of the year. As expected the wine is very different. The nose has some green herby / capsicum and I could not smell oak characters. The tannins here were more grainy and bigger body with lots of fruit cake, pepper and hints of mocha. Pass the Beef with Blackbean sauce (with lots of broccoli) and a double helping of fried rice. The grapes for this wine were picked on the first day of the heat wave that defined the 2008 vintage. The 19.5% alcohol is first suspected by the slight burning sensation on the back of the nose when smelling the wine (or for those that follow Lonely Grape TV – Doing the wanky thing). The nose and palate is dominated by licorice and sweet/clean fruit. The finish is a little short when compared to some of the classical McLaren Vale Vintage fortified styles but I enjoyed the clean lines. Pass the decanter – is it to the left? 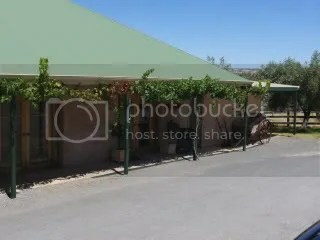 This entry was posted in Mclaren Vale, wine and tagged cellar door, Chardonnay, Mclaren Vale, McLaren Vale Wine, Shiraz, Small Producer, wine, wine McLaren Vale. Bookmark the permalink. Hi Shane, Do you go further afield in your cellar door and wine explorations? There is a new cellar door on the Mt Comapss to Victor Harbor road called Square Waterhole, which I think you would enjoy checking out. I think the area might be classified as Mt Jagged or Fleurieu, but I’m not sure. Anyway, I think you might find it a worthwhile cellar door to visit!